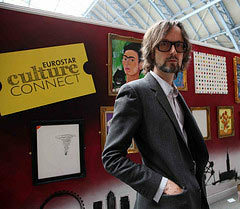 Sony award nominated 'Rising Star' and Hoxton resident, Jarvis Cocker was at St Pancras International this morning to launch Eurostar's Culture Connect scheme, encouraging cross channel passengers to visit iconic cultural institutions in London, Paris and Brussels. Spending roughly half his time in Paris, Jarvis is a regular through St Pancras, passing through at least once a week to do his BBC 6Music show, and a self professed expert on train sandwiches. Eurostar are pleased as punch to have Cocker as their Cultural Ambassador. Not only does he have huge credibility through his music, presenting and other artistic endeavours, he's a family man and train travel fan. Could be just what they need to get over the bad PR taste of strikes and mid chunnel breakdowns. Five of our national museums: Tate Modern, The National Gallery, National Portrait Gallery, V&A and The British Museum are London partners in the scheme. With a wave of your Eurostar ticket, 2 for 1 admission is yours to five museums and galleries in three Eurostar cities (inbound journeys only, mind). Any of you lot taking the train through the tunnel this year could try the Musical Instrument Museum in Brussels or Le Musee d'art moderne de la Ville de Paris. Of course, our national treasures are free entry anyway so this scheme will get tourists into the special exhibitions (Henry Moore, Grace Kelly and the forthcoming Fakes, Mistakes and Discoveries at the NG for example). But what if Jarvis was your personal Cultural Ambassador to London? We asked what he'd recommend to visitors for a truly London culture fix, outside of spending time at the 'twofer' blockbusters. After a visit to the ICA (which needs your support) he'd send you round his manor: to Hoxton to look at the haircuts, a cultural phenomenon in themselves.